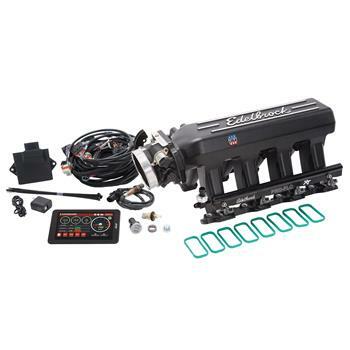 Edelbrock pioneered the aftermarket EFI industry with the first system in 1979. Every generation of Pro-Flo Electronic Fuel Injection since, has continued to deliver the performance you want. We are excited to announce the latest edition – Pro-Flo 4. Pro-Flo 4 has expanded to include NEW kits for popular Chevy LS models, and has also been improved with the latest technology and features. Most of these advancements are in the all-new ECU, which features a faster processor, a water proof design and measures half the depth of the previous ECU. It also has an upgraded Bluetooth chip that is faster, more reliable and will not drop connection. Finally, we’ve added more features for the advanced tuner giving you control over cold starts and acceleration, while retaining the simplicity Pro-Flo is known for and proven to deliver. Pro-Flo 4 does not require laptop tuning. The key to the system is our exclusive E-Tuner 4 application with base calibrations that have been developed on our dyno. The E-Tuner 4 app uses a Bluetooth wireless connection to communicate with the ECU’s self-learning capability to continually adjust the calibration to get the maximize performance of your engine. E-Tuner 4 features a simple and easy to use setup wizard to help you get started. Best of all, the E-Tuner 4 app is free and can be downloaded from the Google Play Store, allowing you to use your personal Android based smart phone or tablet. If you don’t have a compatible device, then we also offer kits that include a 7” Android tablet with the E-Tuner 4 app pre-installed. Another great feature of Pro-Flo 4 is the ability to control both fuel and spark from the E-Tuner 4 app. E-Tuner 4 app gives you complete control of the system with the ability to adjust air-fuel ratios, ignition curve, idle speed, acceleration fuel, coolant fans, Rev limiter and much more. Multiple dash displays are included to allow you to monitor engine vitals and performance from your Android smart phone or tablet.